Power up the GR-700 while holding down the STRING SELECT NO. 4 button. If the displays shows 1-4 the version is 4. There are five different versions of software for the GR-700. The most radical change came with the last version, version 5 (or 1.5). The most common version in my experience is version 4. The GR-700 service notes explain the differences for versions 1, 2, 3 and 4. I have seen a few GR-700s with version 5 software. 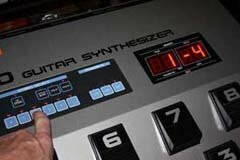 What version software does your synth have? This is easy to check! Power up the GR-700 while holding down the STRING SELECT NO. 4 button. The display will show the software version, 1-4 means version 4. 1-2 indicates version 2 software. Incidentally, the patch corresponding to the software version will be selected when doing this procedure. Version 1:Initial software release, with the original GR-700 patches. Version 2: Version 2 allows the changing of the Chromatic circuit equal temperament pitch. In Version 1, if you are in chromatic mode, and play an "A" you will hear a note pitched at 442Hz. While A=440Hz for most Americans, some European orchestras use A=442Hz, and A=445Hz in Germany, Austria and China. With version 2 software, you can press 4 - 8 while in edit mode and adjust the chromatic pitch of "A" from 438 to 446Hz using the EDIT (resonance) knob. Version 3: The GR-700 can fail to maintain sustain level if the EDIT (resonance) knob is turned to maximum when the SUSTAIN LEVEL is being edited. The software address this problem. Version 4: In earlier versions, the frequency range which is covered and defined as the note "B" is narrower when compared with that of other notes. As a result, a note in the lower "B" range would be recognized as "A#" Version 4 fixes this problem. Version 5: MIDI input, plus improved speed and tracking and NEW Factory Presets. Version 1.5 is, on average, about 1.5 milliseconds faster than version 4. Version 5 has the ability to determine pitch in half a wave cycle, which is the current standard for pitch tracking. Earlier version (1-4) required a full wave cycle. 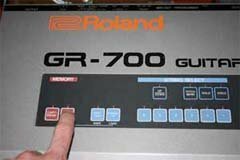 The MIDI input requires extensive hardware revisions to the GR-700, in addition to the new software. Click on the links above to download a ZIP file containing two binary files, an IF (interface) file, and a SH (sound) file. These files must be used in pairs. 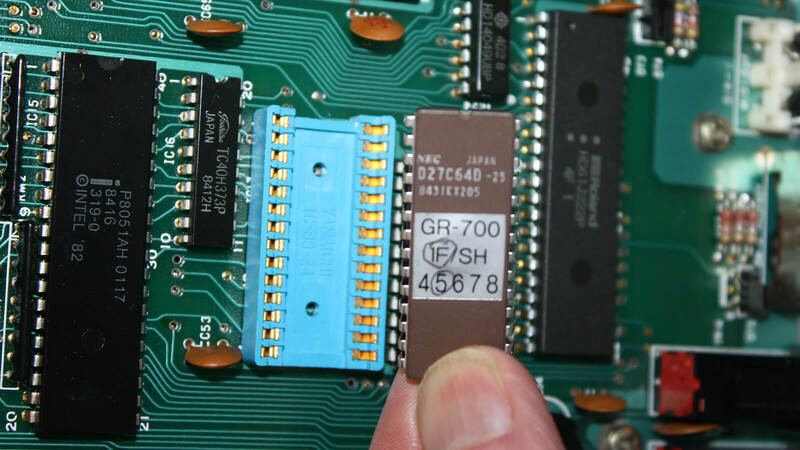 The IF file is software for the operation of the GR-700, and the SH file contains the new factory presets. 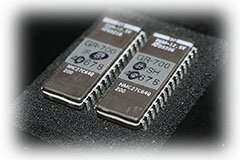 You cannot mix and match different chips, or the GR-700 will not boot up. Should I Upgrade the Software in the GR-700? If you are using version 1, 2 or 3, the GR-700 will be enhanced with the various fixes mentioned above. The factory presets will stay the same. Version 1.5 changes how the MODE Switch works. In versions 1.1 - 1.4, the MODE switch offered two levels of sensitivity. Middle position is standard sensitivity, and the UP position is more sensitive. This is somewhat similar to adjusting all six trimmers to make the synth trigger with less force. In Version 1.5, the MODE switch in the Middle position is the same as Version 1.4, but in the UP position the GR-700 will trigger faster. Version 1.5 also features different Factory presets (banks 1 - 4). If you like the Factory sounds in 1.4, be sure to back these up before changing out the chips. 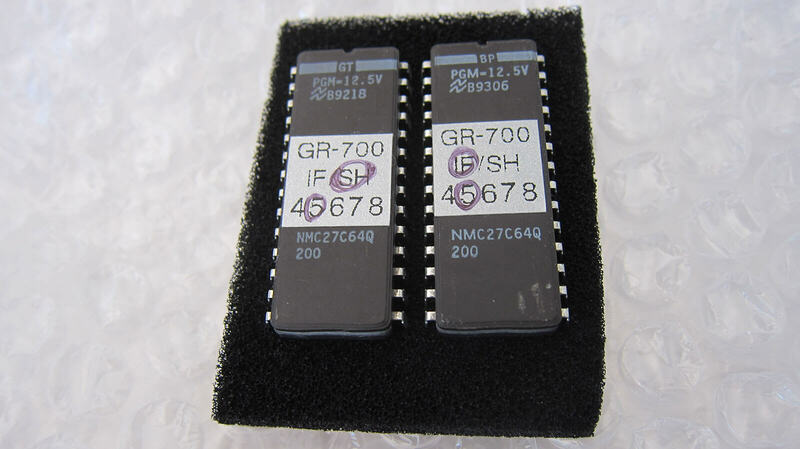 Click here to view the Factory presets on the GR-700 page. 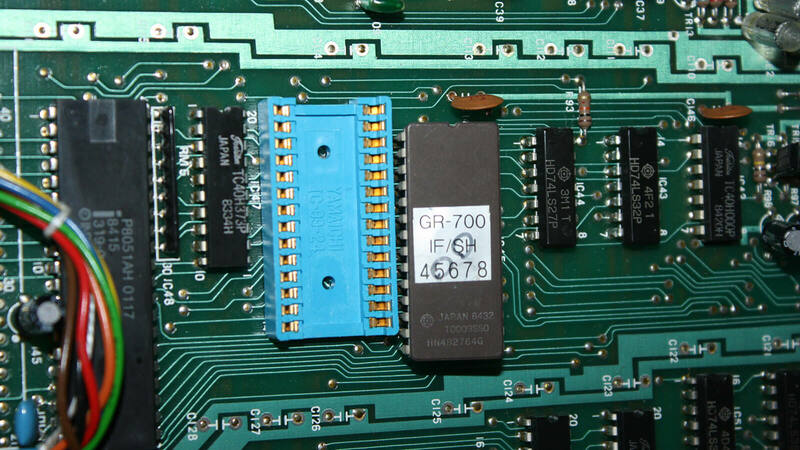 After installing the new EPROM chips, may want to reinitialize the GR-700 to load the new sounds. This procedure will erase the sounds in the GR-700 and reload the Factory patches into banks 1-4. Be sure to back up any sounds you want to save. See below for more information on reinitializing the GR-700. As noted, the GR-700 does not come with a MIDI input. 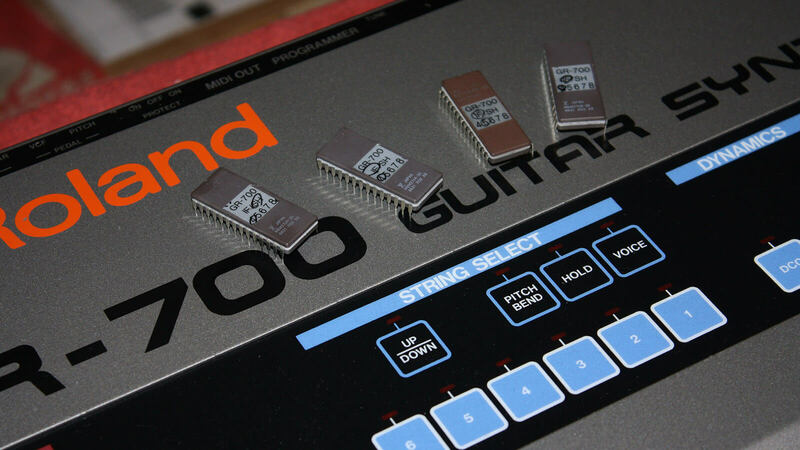 While there was never a formal "factory retrofit" from Roland to add a MIDI input to the GR-700, a MIDI input upgrade was available from former Roland technician Mark Tsuruta. I understand Mark had come from Roland Japan to work at the Roland headquarters in Los Angeles. The software necessary for the MIDI input is the rare version 1.5 software. These files must be burned on EPROM (Erasable-Programmable-Read-Only-Memory) chips. 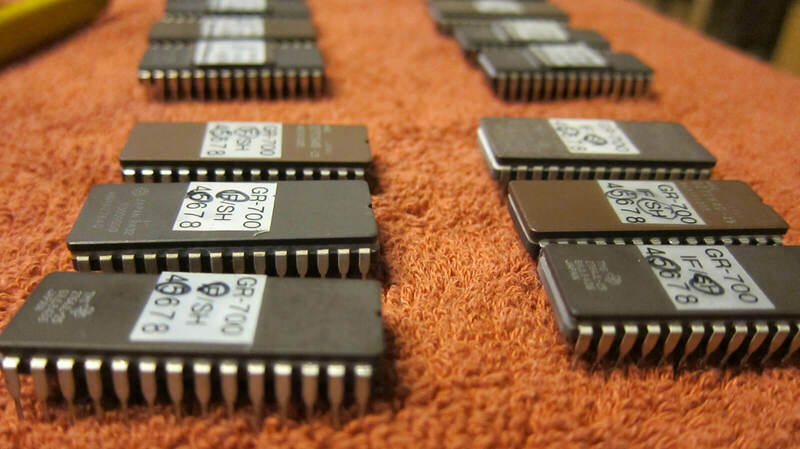 An EPROM is a ceramic chip with a quartz window. The window is used to erase the chip by exposure to UV light. A specific type (wavelength) of UV light is required. This procedure may be a little more involved than what you are expecting, you may want to contact a professional service for these chips. I have a link below of a service I found. 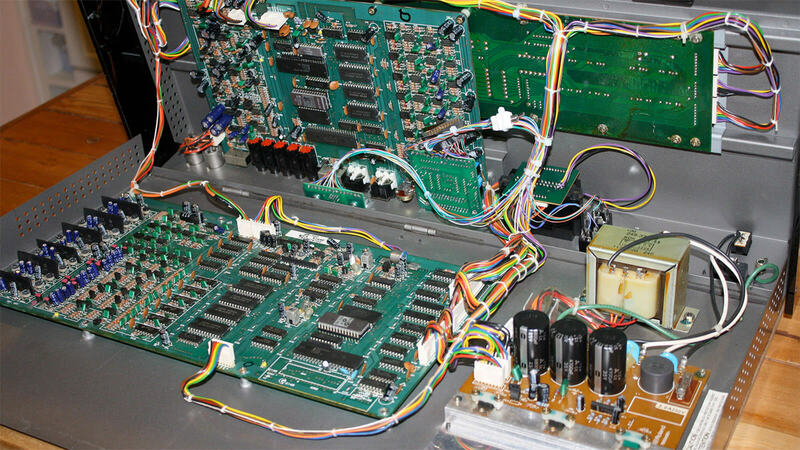 If you do some digging, you will find that a lot of vendors who offer this service are in the vintage video game repair service. 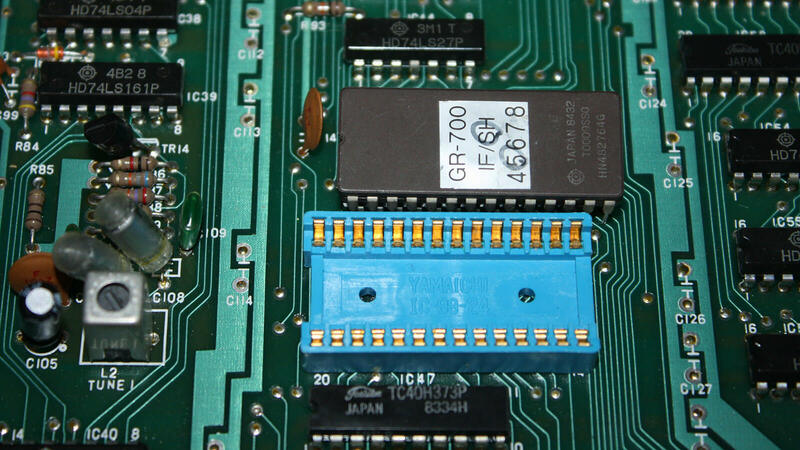 Similar EPROM chips as used in the Roland GR-700 were also used for the operating systems in video games. 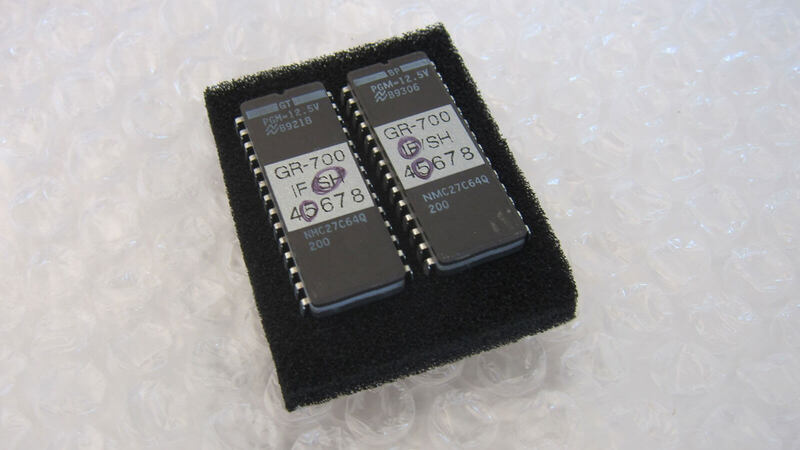 It is possible to reinitialize the first four banks of patches for the GR-700, banks 1 though 4. There is no way to recover patches in banks 5 through 8 if they have been lost. To reinitialize patches in banks 1 - 4, turn on the power switch while pressing down the WRITE (copy) button. Be sure to set the rear panel memory protect switch to the off (middle position) to have the memory protect circuit turned off. Since the GR-700 only restores the contents of banks 1-4, banks 5-8 may contain random data after reinitialization.